Many of you who write content regularly should be familiar with the Long Tail Pro (LTP) keyword tool. It’s been around for a long time and recently has a new branding facelift. In today’s review, we’ll take a deeper look at its feature, what it can deliver and whether you should use it or not. LTP was created by Spencer Haws from NichePursuits in 2011. He’s an online entrepreneur who wears many hats – as an Amazon seller, website flipper and niche marketer, just to name a few. So he’s a pretty legit guy whose products has earned endorsement from big names in the internet marketing industry like Pat Flynn and Darren Rowse. The main purpose of this tool is to create niche related content using descriptive and less competitive keywords (hence long tail) so that the page can rank and monetize over a long period of time. Hence, it is designed for anyone who wants to capture sustainable online traffic to their sites such as affiliate marketers, eCommerce sellers, small business owners as well as PPC marketers. Sometime ago, LTP was a software that needs to be downloaded in order to run. That’s not the case anymore. With the current version, you can basically operate the tool from a PC or mobile, as long as there’s internet access. The tool serves four functions. 1 – Keyword Research – It brainstorms for new long tail keywords using seed keywords (Related Keywords) and keywords drawn from a competitor’s page. That means, it will mix and match those keywords and display the ones that are most relevant. If you already have a list ready to go, up to 200 keywords can be manually entered to retrieve metrics on their search volume and difficulty (Average Keyword Competitiveness). For advertising and PPC, you’ll also get indications of CPC and Adwords Competition. 2 – Rank Tracker – Want to know how a page is faring after publishing? The rank tracker feature will check on the progress based on certain keywords (you have up to 200 for this). It will show which search engines have been indexed, the region where the page is most visible and an estimate of the ranking position. 3 – Backlink Analysis – Web page ranking based on back links has changed over the years and what matters most now is to link to quality sites in a contextual manner. In case you want to check on the domains that are linking to a particular page, this feature can be somewhat useful. 4 – SERP Analysis – This feature basically analyzes competitors performance for a particular keyword in which you can visit the top 10 pages to see how they fare in terms of content quality, number of back links and internal links, just to name a few. It also indicates the age of a page, hence a mature site is more established and harder to outrank. In terms of pricing, LTP is a subscription based keyword tool. When it was a software version, it used to be a one-off payment that offers lifetime access. Now, it comes with monthly and annual plans that are divided into 3 categories (Starter, Pro and Agency) to suit the different load of usage in terms of keyword research, rank tracking and the number of admin logins. Monthly plans range between $37 to $147 per month while the annual plans could go up to $297 to $1177 per year. All plans come with 10 day money back guarantee, but there’s also a 7 day free trial if you decide to start with an annual plan. Here’s a breakdown of what’s included in each package under the annual subscriptions. It’s also worth mentioning that in every annual plan, Spencer has included a free keyword tutorial course called Long Tail University. It comprises of ten lessons and several webinars that will walk you through keyword intent, on-page SEO and all the way to keyword tracking process. On its own, the course would have cost you $397. With that said and done, let’s see what are the perks of using LTP as a keyword tool. 1 – Grouping keywords in an organized manner is a good practice to keep your content ideas in order. It helps to plan your writing tasks for weeks and months to come so it’s extremely helpful if you are managing several topics or multiple niche blogs at the same time. Inside LTP, keywords can be grouped into ‘Project’ so it’s convenient to view or retrieve your list when necessary. 2 – One of the most important metrics is called keyword competition and I like the fact that the values automatically display on its own instead of having to click on each individual line. They load pretty fast too so it saves a lot of time. 3 – LTP is flexible in a way that it can be used to discover keywords for SEO as well as paid traffic. All plans come with this feature so every (new) user will have at least a tool in hand when they want to get into PPC marketing. For those who just want to focus on organic traffic, the column can be customized to reflect metrics that matter to them. 4 – If you want to research for geo-targeted keywords, you just need to change the language and the country settings. This feature is great for those involved in local businesses and marketing. 5 – Not all generated keywords will come with the ideal values that we want. For SEO keyword competitiveness, LTP suggests less than 30 so you can actually use the filter feature to set the values you want to see. The same thing can be done for other metrics like search volume, CPC bids or advertiser competition. 6 – When it comes to competition analysis, LTP provides up to 12 metrics for you to methodically examine the top 10 pages. If you like to scrutinize the number of back links, internal links as well as the maturity of a site, this feature can offer pretty good insights. 7 – The tool comes with 14 free video tutorials (not to be confused with Long Tail University course) on how to search for long tail keywords and steps to implement them in your content. If you are totally new to keyword research, it will serve as a good introductory training on the subject matter. 8 – When I first started blogging, I got to know about LTP through the Clickbank marketplace. That means, one can leverage from their affiliate program to earn additional income through their sites. This product will be most appropriate for people in the blogosphere and the content creation niche. Since April 2017, the company has joined the ShareASale network as a merchant and they are offering 30% commission per sale. Unlike Clickbank where hoplinks can be applied for immediate promotion, approval is required in this network before you can market as their affiliates. 9 – Lastly, I have to give kudos to their prompt customer support via live chat and email. When I ran into some payment issue, they were quick to respond and the issue was resolved within minutes. For a keyword tool that is almost wholesome, it’s hard to find any negativity to talk about. However, there are a few minor setbacks that I still want to point out. 1 – By default, the keyword results will stacked onto one another after each research. For example, 50 different suggestions from keyword A and keyword B (and so on) will merge into a long list of 100 over keywords. Since it doesn’t open on a new display, it makes examining a bit more exhaustive. This isn’t such a big deal as you can always delete the first display before moving on to the next research process, but it’s just another extra step that you need to take. 2 – If you are looking for domain suggestion and availability, you’ll not find it within LTP for sure. This feature is mostly needed for people who are interested in buying and selling domains or wanting to discover a profitable niche. 3 – The rank tracker feature is a bit slow in the sense that it doesn’t show you the result immediately. LTP could take up to about 24 hours to show the performance of my web pages, while the keyword tool that I frequently use is almost always instantaneous. Overall, LTP is a decent keyword tool. It’s created by someone who has experience in this field, the interface is easy to use and it caters for users from different backgrounds and budgets. The latest version has shown quite an improvement from the old one and I am sure that it will continue to evolve for the better in the future. In any case, if you are on a shoestring budget or still looking to explore other online opportunities, this robust platform has a free basic keyword tool, website hosting and marketing training – all for the price of one – to help you get started. Do check it out and if you have other questions or comments, just leave them in the space below. Keyword research is really important. 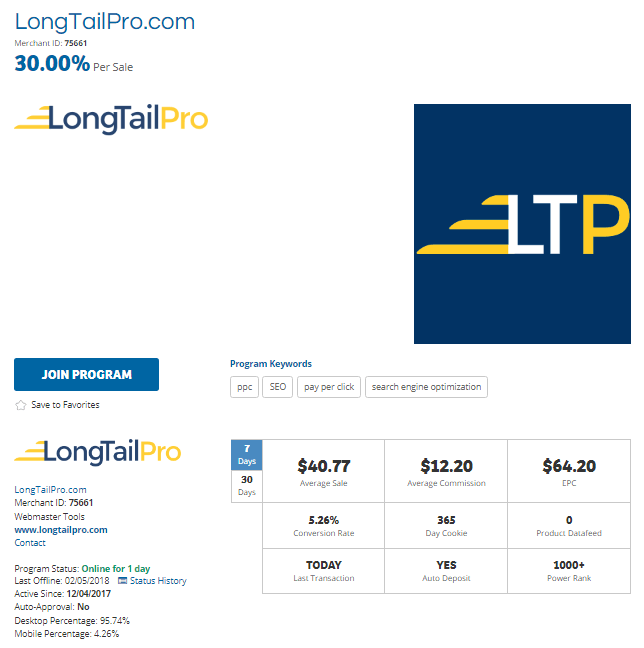 Long Tail Pro seems like a good keyword research tool to have. I really like the SERP analysis feature. It looks like it would fit any budget, which is great for me. I see what you mean about the keyword results stacking up onto one another that would get a bit tedious to take an extra step but sometimes taking that extra step is worth it. I wouldn’t want to wait up to 24 hours for the results of the rank tracker feature, but there are other options for that so all in all I think that this is a good tool to use. This is a really interesting read and also very informative. My only experience with a keyword tool has been Jaxxy so it was good to be able to compare the two. Though I think Jaaxy may be a little more basic. However, with my limited time with WA, I’d like to get your opinion. Is Jaaxy enough for me right now and/or is it something I could gain use of further down the track? Hi Paul, if you are just trying out online marketing for the first time, stick to the free version of Jaaxy that can be found within your WA Premium Membership. Yes, it’s very basic but remember, traffic generation comes from content writing and engagement, not based on keywords alone. Use it to maximize content production and do so frequently on your blog. If you target a low competition, high search volume keyword, but come up with a poor quality or irrelevant article, your page will still not rank. When traffic starts to get more traction or best, if you are earning some commissions, Jaaxy is certainly a good investment to find out more about page ranking, competition analysis and other affiliate programs relevant to your niche. Thanks for this expository article. I’ve been told that LTP is a really good tool for bloggers and website owners so I am hoping to try it out on my new blog. I want to expand my keyword research and do some back link analysis. Glad to know that they have a free trial option. Are all features available on the free trial? Yes Zuchii. They can all be accessed through the 7 day free trial. I started my blog almost a year ago when I had no idea what I was doing. So I had to do a lot of research on how to make it work. I also joined a program that can teach everyone to become successful in any niche they are passionate about. And one of major things this program focuses on is the use of long tailed keywords when writing articles in order to get better rankings. And in order to do that, we need a Keyword tool. Long Tail Pro Keyword Tool was one of those I was looking to sign up with but I wasn’t sure if it is really necessary to spend money during the early stages of your blog site when you haven’t actually made money yet. I do understand how important a keyword tool is so I’m wondering if LTP has a starter (free) membership or 1 month trial so I can get to check it out first to before going for the monthly plans. Hi there Alice, LTP does have a trial but they are only available for 7 days. I recommend using that period to make full use of the interface and see if it works to your liking. If you have a hard time finding targeted keywords relevant to your niche OR if the price isn’t within your budget, try this free tool instead. It works just as good, churning out the basic metrics minus all the other fluff that only comes when you have more traffic to your site. I am always looking for more and better tools, especially for keyword research. This looks pretty useful too me. I like the competition research that comes up. Checking for links and backlinks is another feature I like. Bad backlinks can really mess with site rankings so we need to stay on top of that. It sounds like this used to be on Clickbank but is now on Shareasale. Is that true of is it on both now? If I have a bunch of keywords already, do I really have to manually enter them into LTP or is there a way to import them via a csv or something like that? Hi Curtis, the tool is still on Clickbank although I don’t know if it’s still active or not. On the current homepage, the affiliate program is directed towards ShareASale, so I guess that’s the network that they are planning to use moving forward. If you already have a keyword list, yes – you will be able to import them via CSV onto the tool. Hope this helps. I’ve been writing content online for over a year now, but I haven’t heard of the Long Tail Pro keyword tool before. The tool that I am using is Jaaxy and it hasn’t let me down yet. I am always looking for other ways to find better keywords though as you will never know when you might find one that could really change the visitors count on your website. That is what we are all aiming for, isn’t it? It does seem a bit pricey though and I know you said there’s a 7 day free trial, but do you have to pay the annual fee to get the free trial or can you just test it without paying anything? Hi Matthew. Getting the right targeted keywords is just one of the factors that can influence your traffic. Paired with good content and diligent SEO, the number can gradually increase for sure in accumulative effect. Just don’t get the impression that one keyword can change the entire direction of your site, for better or for worse. As for Long Tail Pro, you can test without paying, but they do require to key in your credit card information. If you don’t want to continue, simply cancel your account before the 7th day and you wouldn’t be charged. Hope this helps. This tool sounds pretty useful, however I had a couple of questions. I use Jaaxy currently as a keyword tool and just use the free version. Is Long Tail Pro better or more accurate than Jaaxy? Also, is it worth paying money for, when I can get a good enough service from Jaaxy? I’m just not sure what more I would get out of LTP with payment. Would be great if you could let me know, thanks! Hi Joe, all keyword tools can only provide you with an estimation and never an accurate number because search data changes from time to time. If you are looking to combine keyword research for SEO and PPC, Long Tail Pro can offer both. If you are looking to master organic traffic first, then the basic Jaaxy, even the free version, is good enough to start with.